As per the new map policy, Survey of India has put up nine of its geographical maps on its website thus, bringing them into easy access of the public especially for the students, free of cost. The farming community here is yet to reveal the party they would support in the ensuing Lok Sabha elections. 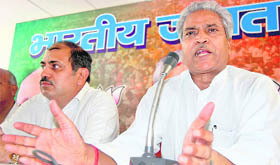 National general secretary (Organisation) of Bharatiya Janata Party Ram Lal today said the party would set its house in order in Uttarakhand before the Lok Sabha polls. Taking a cue from the strategy of Bharatiya Janata Party during the last parliamentary election, the Sewa Dal, a Congress wing, is making use of information technology to woo the voters. The Congress today accused the ruling BJP of completely “ignoring” the interests of the minority community and Dalits in the state. Ashes of the father-in-law of Priyanka Gandhi Vadra, daughter of late Prime Minister Rajiv Gandhi and Congress president Sonia Gandhi, were today immersed in the holy Ganga river. Rajinder Vadra’s body was found from his house in South Delhi under suspicious conditions on April 3. He was later cremated at the Lodhi crematorium. On the occasion of the World Health Day, an initiative on disaster control was set up in the Shri Mahant Indresh Hospital, here today. A talk was also organised by Medical Education Unit and department of Community Medicine of Shri Guru Ram Rai Medical College. At the ongoing craft mela organised by Tamil Nadu Handicraft Development Corporation, an undertaking of Tamilnadu Government in the city, a 6 feet tall wooden sculpture of three-faced lord Ganesha is attracting crowd in for its finesse and distinctiveness. The statue costs whopping Rs. 1.1 lakh. All major temples were decorated on the occasion of Mahavir Jayanti in the city. Bhajan and cultural programmes were also organised in the city temples. Governor BL Joshi today said economic development should not be limited to some select areas and must reach the hill areas of the state. As many as 27 cadets of Class X of Rashtriya Indian Military College (RIMC), accompanied by Balbir Chauhan and Neeraj Negi attended white water rafting on the river Ganges from March 29 to April 2. The course included training for four days and expedition on the last day. The cadets were divided into teams of 4-5 cadets and were introduced to the modern rafts and various other commands of the adventurous sport. Two youths drowned in Ganga canal while they were trying to cross it, here today. The deceased have been identified as Rahul, a resident of Dhanpura, and Nicky, a resident of Kasabpur in district Meerut of Uttar Pradesh. Rahul and Nicky were on a visit to Mata Chandi Devi temple along with one otheir relative, Amit. The police has arrested a truck driver, Mohkam, today who had fled away after running over a three-wheeler driver in an accident on April 5 night. Dehradun will host its first BCCI recognised Center Zone Cricket Camp for Boys u-16 at Abhimanyu Cricket Academy from April 16 to May 22. ACR United and Doon Defence Academy won their respective matches at the Khalanga Cricket Tournament, here yesterday. On the fourth-day of the 2nd ONGC CMD Cup Cricket Tournament being played at the Abhimanyu Cricket Academy Grounds here, Mumbai Matadors defeated Cauvery Cheetahs, here today. So far, the survey of India only provided maps on hard copies at a minimum cost. Maps include physical map of India, outline map of India, political map of India, Indian roads and air routes, Indian railways and sea routes, Indian soils, Indian population, Indian average rainfall and railway map of India. All these maps are now available in the PDF format in the department’s website, surveyofindia.gov.in. As per the National Map Policy 2005, the department aims to ensure easy availability of general welfare maps to the public. The process of digitalisation of maps are being carried out speedily. The department also intends to start online services, said Survey of India sources. A national survey and mapping organisation under Department of Science and Technology, Survey of India is one of the oldest scientific department with its history dating as old as 1767. Surveyors had an onerous task of exploring the unknown.Bit by bit the tapestry of Indian terrain was completed by the painstaking efforts of a distinguished line of surveyors such as Lambton and Sir George Everest. Department has now grown into 18 directorates spread in all parts of the country to provide the basic map coverage required for the development of the country. Its technology, latest in the world, has been oriented to meet the needs of defense forces, planners and scientists. It’s role in preparation of maps for the proposed Larsemann station in Antarctica has been most challenging. Earlier, leaders of kisan unions had announced that they would decide upon the course of action once all political parties announce the names of candidates. Now after declaration of the names, the community is evaluating the policies of various political parties as well as the candidates’ approach towards the farmers, before making a final decision. “Meetings are being held at several places to give final shape to our strategy for the forthcoming elections. Senior leaders of all the parties, including the candidates, are in touch with us. Most probably, we will announce the party we support on April 9,” said Sanjay Choudhary, president, Bhartiya Kisan Union (BKU), district Haridwar. “On April 9, a state-level meeting of farmers will be held, which will be attended by all senior leaders. A decision will be taken after that,” added Choudhary. In addition to BKU, major groups like Uttarakhand Kisan Morcha (UKM) also represent the farmers. However, it seems that all the groups share a common view that they would not support BJP due to their alleged anti-farmer policies. The farmers do not seem happy with the Bahujan Samaj Party as well. “In UP, where the BSP rules, the state of farmers is not good,” said UKM’s general secretary Rakesh Aggarwal. “The UKM will not support the BJP at any cost,” he added. On the other hand, the Congress and Samajwadi Party leaders are holding meetings with kisan leaders in a bid to woo them. “We have always stood by farmers during their difficult times. Harish Rawat (Congress candidate from Haridwar) has always supported the farmers and enjoys good rapport with them. So we are hopeful they will support Rawat,” said a Congress leader on condition of anonymity. In Haridwar, the votes of farmers are around 32 per cent while in the entire state it is nearly 50 per cent of the total votes. The BJP leader also claimed that UPA is fast disintegrating and on the other hand the tally of NDA allies is increasing. “Disillusioned and disappointed with the five-year rule of UPA, its allies are saying goodbye to the Congress-led alliance. But the NDA is becoming stronger. Several regional parties in different parts of India had joined hands with NDA,” he said, adding that Biju Janata Dal (BJP) will meet the same fate in the Orissa Assembly elections as that of Janata Dal (United) after the latter betrayed the BJP in Karnataka. Ram Lal also said the BJP has taken up the issues of the commoners in its manifesto. “Besides waiving farmers’ loans, we have promised to give agricultural loans at the rate of a mere 4 per cent. Every village with a population of 500 will be connected with roads and there will be no income tax on annual income up to Rs 3 lakh,” he said. candidate, no other political party has been able to make a consensus over their prime ministerial candidate. He said the BJP is the only party that had included several issues pertaining to ex-servicemen in its manifesto, and that the only aim of the party was to ensure that every person gets three meals a day. Later, he inaugurated the BJP Media Cell, set up at the party’s headquarters here on Balbir Road. Prominent among others present on the occasion were BJP general secretary (organization) Naresh Bansal, party’s state general secretary Tirath Singh and state spokesman Vishwas Dawar. The initiative is being implemented by newly appointed incharge of Uttarakhand Sewa Dal Rajkumari Soni. She has also been designated as the incharge of all five Lok Sabha seats in the state. Soni said the scheme would be confined to relatives and friends of all Sewa Dal and Congress party workers. “We have directed all Sewa Dal members to use the phone for half-an-hour each in the morning and late evening to convey the party’s message and work done by the United Progressive Alliance during its five-year term,” said Soni. Meanwhile, the Sewa Dal today released the names of Lok Sabha incharges for three seats in Uttarakhand, along with 70 assembly incharges. For Pauri Garhwal Suresh Dimri has been appointed incharge; and for Tehri Garhwal and Haridwar the names of Suraj Pal Singh and M Lal have been announced, respectively. Coming down heavily on the BC Khanduri government for discontinuing several schemes initiated by the UPA government for the welfare of the minorities and Dalits, Congress candidate from Tehri Vijay Bahuguna said it was unfortunate that during the past two years the state government had failed to utilise the budgetary allocations under the Special Component Plan (SCP). Addressing a rally at Sahaspur, around 25-km from here, Bahuguna said immediately after taking over the reins of Uttarakhand, the BJP government discontinued the 15-point programme started by the Congress for the minorities. “Later, the Waqf board was dissolved and has not been reconstituted till date,” he said. Accusing the Khanduri government of putting breaks on the wheels of development in the state, Bahuguna said the present government has no vision for development of the hill state. “The masses are happy with the competent leadership of Prime Minister Dr Manmohan Singh and UPA chairperson Sonia Gandhi. Because of the visionary approach of the UPA, today the wave is in favour of the Congress in the entire country,” he claimed. Terming the decision of the Union government to waive farmers’ loans amounting to Rs 72,000 crore as historic, Bahuguna said during his two-year tenure as Tehri MP, he made all efforts for the progress of people of the constituency. “A Rs 150 crore package for rehabilitation of those displaced from Tehri, survey of a railway line from Dehradun to Kalsi, establishment of Hydro Power Engineering College in Tehri and central status to the Garhwal University, all goes to the credit of Congress,” he said. Ashes of the father-in-law of Priyanka Gandhi Vadra, daughter of late Prime Minister Rajiv Gandhi and Congress president Sonia Gandhi, were today immersed in the holy Ganga river. Rajinder Vadra’s body was found from his house in South Delhi under suspicious conditions on April 3. He was later cremated at the Lodhi crematorium. The programme of ashes immersion was kept a secret and security was beefed up at the venue. Even the media did not have any clue of the visit. At 12:10 pm Priyanka Gandhi along with his husband Robert Vadra and relatives reached Har-Ki-Pauri and performed rituals at the Brahma-Kund ghat. However, as the news of Priyanka’s arrival in the city spread a crowd gathered and shutterbugs started flashing. 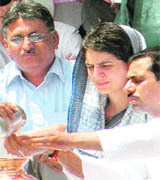 Pandit Sanjeev Jha performed the rituals, and subsequently both Priyanka and her husband visited Ganga Sabha office and entered their names in the data book. Later, the entourage left from the CCR towers to VIP ghat and then to the state guesthouse in Damkhoti. They left for New Delhi by a private airlines flight at 3:30 pm. Meanwhile, even local Congress leaders were not aware of the visit. City Congress chief OP Chauhan was addressing a press conference in Haridwar, but on hearing the news made enquiries on phone. On the occasion of the World Health Day, an initiative on disaster control was set up in the Shri Mahant Indresh Hospital, here today. A talk was also organised by Medical Education Unit and department of Community Medicine of Shri Guru Ram Rai Medical College. The slogan for this year is save lives and make hospitals safe in emergency. Various issues pertaining to the topic were discussed like global and local impact of emergencies, preparedness and mitigation etc. Dr Roopa Hanspal and Dr Megha Luthra of Department of Community presented the talks. On this occasion all the departmental heads and other doctors of Shri Guru Ram Rai Medical College and Shri Mahant Indiresh Hospital were present and made their contributions to make the hospital safe for combating disasters. It was urged that regular mock drills should be conducted in the hospitals to ensure preparedness of health care facilities during emergencies. Dr Sanjeev Mittal, head of department of Opthalmology took an initiative to make a disaster control committee in Shri Mahant Indiresh Hospital with the cooperation of other doctors. The sculpture of lord Ganesha is made of Vagia wood at Kallakuruchi, near Salem in Tamilnadu. “For such a big statue, one whole tree is used. After the tree surface is made smooth, then design is made after which carving and finishing is done. Work is assigned according to the skills of the artisans,” said Loganathan, an artist. “At least six to eight people are needed and around 4 months are required to complete the statue. As this wood is termite proof it can easily be maintained by just varnishing and can last for several years,” said Loganathan. However, brass icons of deities are also exquisite and depict Chola Pallava and Hoysala dynasties that ruled the southern part of India, centuries ago. “Various statues of bronze, brass, wood, stone and tanjore is traditional art of south India, and the authentic pieces which were discovered during the period of rulers are displayed in the museums. The artists in Tamil nadu are trying to make the artifacts something contemporary,” said Rajmohan, accountant Tamil Nadu Handicrafts Development Corporation. Panchantara metal is used in brass items. The attraction amongst the brass items was a statue of lord Natraja, which is considered the driving force and auspicious during classic dance of bharatnatyam. “The statue of Natraj plays an integral role while performing our classical dance bharatnatyam and costs whopping Rs. 2.64 lakh,” said Loganathan. Lord Balaji’s tanjore painting, made in Thanjavur, Tamilnadu, is one of the finest pieces displayed in the fair. It is made out of tamarind and gum paste and is decorated with gold leaf, temple jewellery and painted with water and vegetable colours. The tanjore paintings are framed with teak wood and come for a price of 1.5 lakh. “The paintings and other artistic creations displayed at the fair are beautiful and I loved the tanjore painting,” said Priyanka, a visitor. These statues are supplied to various temples and hotels in India and are also exported to USA, London, Malaysia and many other countries. “Awareness amongst masses has made people sensitive towards our work. We are happy that now we are even exporting our pieces of art and people are extensively using it for decoration purpose,” said elated Rajmohan. BHEL executive director DK Modi hoisted the flag during the ceremony at the BHEL Jain Mandir. A shobhayatra, was taken out through the various sectors of the BHEL. The lord Mahavir statue was coronated with 1,008 silvers kalash. Apart from the Jain community various sections of people attended the functions. He said organisations like the Confederation of Indian Industries (CII) could play an important role in this regard. Joshi was interacting with a delegation of CII at Raj Bhawan, here today. Uttarakhand president of CII Rakesh Oberoi presented a report - “Policy for development of the hill areas of Uttarakhand - Building and Organic Green State” - to the Governor. Meanwhile, Joshi also had a look at the recently launched world’s cheapest car Nano. As many as 27 cadets of Class X of Rashtriya Indian Military College (RIMC), accompanied by Balbir Chauhan and Neeraj Negi attended white water rafting on the river Ganges from March 29 to April 2. The course included training for four days and expedition on the last day. The cadets were divided into teams of 4-5 cadets and were introduced to the modern rafts and various other commands of the adventurous sport. The modern rafts were about 16 feet in length and were made of nylon fabric and coated with synthetic rubber. The first two days were spent steering the raft with their paddles at the Veerbhadra Barrage and getting habituated to the various commands. Cadets cleaned up the river by picking up the polythene, flowers and other stuff offered to river by the devotees that polluted the river. Social work has been a vital part of RIMC and the cadets are taught to clean up and maintain any premises they visit. The cadets were made to wear life jackets and helmets as a part of the safety measure. On the third day, they rafted from Phool Chatti to Shivpuri. The cadets also went sight seeing to Har ki Pauri in Haridwar. The camp ended with the expedition. During the course of the expedition, the cadets crossed over the rapids of Grade 3 and 4 - Three Blind Mice, Double Trouble, Club House, Old Camp, Golf Course, Roller Coaster, Body Surfing, Good Morning and Hilton. The cadets got an exposure to the world of rafting, which was a lifetime opportunity for many of them. They also learnt the religious aspects related to the holy river Ganges. Col H Dharmarajan, Commandant RIMC praised the cadets on their efforts and expect that they continue to participate in such adventure activities in a similar manner. Two youths drowned in Ganga canal while they were trying to cross it, here today. The deceased have been identified as Rahul, a resident of Dhanpura, and Nicky, a resident of Kasabpur in district Meerut of Uttar Pradesh. Rahul and Nicky were on a visit to Mata Chandi Devi temple along with one otheir relative, Amit. However, when the trio made an attempt to swim across the canal at Chandi ghat, they drowned. After hearing their frenetic calls, locals and divers from the police force came to their rescue. However, they could only save Amit. Meanwhile, the police have recovered the body of Rahul and the search for the other body is on. In the accident, which took place around 1 am near Shakumbri Maruti showroom on Delhi-Haridwar highway, a 35 years old person, Mohsin was killed. Mohsin was going to his house at Manglore, around 8 kms away from here. After knocking the three-wheeler, the truck driver fled from the scene, leaving Mohisn seriously injured, who later succumbed to his injury in Civil Hospital here. The camp is expected to be of a great opportunity for the upcoming cricketers, who would get training from the national level coaches that will turn up at the camp. Abhimanyu Cricket Academy will be offering all the required facilities for the camp and preparations have already reached in the final stages. Proprietor of the Abhimanyu Cricket Academy, RP Easwaran, said it was a matter of honour for the city to host such a camp. He also disclosed that the academy would be offering facilities like accommodation, food, traveling, tracing and swimming for the center zone players. Manoj Rawat, who is a coach at the academy and has recently received level one coaching certificate from National Cricket Academy said, “The academy will offer two turf wickets for the purpose of practice for the camp. Manoj said the camp would be of a great help for us. It would emphasis on improving the mental toughness and removing technical flaws in the players. “We could learn a great deal from the camp and bring about improvement in our coaching. He said the camp would also benefit the academy, as they would get an exposure by playing with central zone children selected for the camp. Earlier in the month of February, former Australian batsman and NCA director, Dave Whatmore had made a visit here to review the facilities and had categorically added that the conditions in Dehradun was favourable for holding the camp. The first match of the day was played between ARC United and Joshi XI. ARC United won the toss and elected to field. Their bowlers did the job for their team resisting Joshi XI at the score of 90 runs in 14 overs. Kapil was the lead wicket taker for ACR team. He took with 3 wickets in 3 overs. Aman and Neeraj took two wickets each. Joshi XI's Nitin gave his team a good start to make 23 runs off 20 balls, hitting one four and two sixes. Kunal scored 10 runs. Chasing the victory target of 90 runs, ACR United team reached the target in seven overs. Team opener, Virandra and Sunny contributed 26 runs in two overs. Sunny was the top scorer for the team with 30 runs off 15 balls, smashing 2 fours and three sixes. Meanwhile, Virendra hit 26 runs off 8 balls. He smashed one four and three sixes. Neeraj chipped in 29 runs off 5 balls to help his team register a nine-wicket victory over Joshi XI. For Joshi XI, Rakesh was the only bowler who picked up one wicket. In the second match, Doon Defence Academy registered a six wickets victory over Bull XI team. Bull XI scored a modest total of 156 runs in allotted 15 overs. Team opener Uday made 24 runs off 20 balls and Praveen made 14 runs. Vikas and Sunny were the top scorers for the team as both of them made 39 runs. Rajverma and Vijay Singh claimed two wickets. Chasing the victory target of 157 runs, Doon Defence Academy reached the target in 12 overs. Kuldeep was the star performer for the team with 90 run off 37 balls, smashing five fours and ten sixes. Shekhar also made a useful 24 runs. Cauvery Cheetahs batted first and scored 100 runs at the loss of 7 wickets in 20 overs. Top scorers for the team were PJ Shrutikar (15 runs) and SKR Basha (13 runs). For Mumbai Matadors bowling, A Bharun took 3 wickets and ND Maykar took one wicket. In reply, Mumbai Matadors crossed the target and thus won the match by 5 wickets. Ajay Parihar (40 runs) was the top scorer for the team. Bowling for Cauvery Cheetahs, TS Krishwasmay took 3 wickets. Ajay Parihar was declared the Man of the Match.